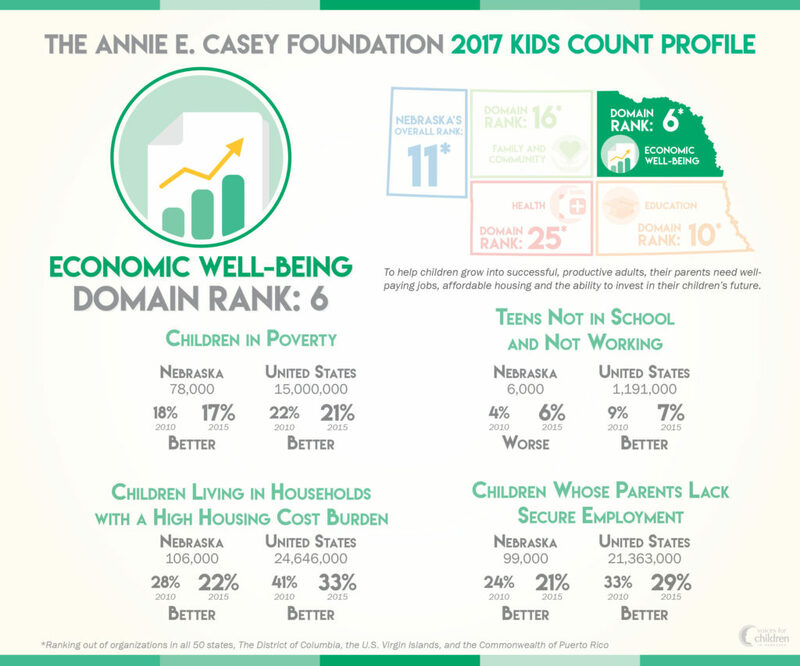 Two weeks ago the Annie E. Casey Foundation released the 2017 KIDS COUNT Data Book, providing an annual snapshot of how America’s children and families are faring in every state and across the nation. In it, Nebraska received an 11th place ranking in overall child well-being. Today, and over the coming days and weeks, we will further investigate the Data Book and how Nebraska kids are fairing in each domain. Of the four indicators in this domain, Nebraska saw improvement in three from five years ago with the percent of teens not in school and not working being the only with worse numbers. Children in poverty: 17% (78,000 children) in 2015 – Growing up in poverty is one of the greatest threats to healthy child development. It increases the likelihood that a child will be exposed to factors that can impair brain development and lead to poor cognitive, health and academic outcomes. It also can lead to higher rates of risky health-related behaviors among adolescents. The child poverty rate in the United States increased dramatically because of the economic crisis and has yet to return to pre-recession levels. The official poverty level in 2015 was $24,036 for a family of two adults and two children. The risks posed by economic hardship are greatest among children who experience poverty when they are young and among those who experience persistent and deep poverty. Children whose parents lack secure employment: 21% (99,000 children) in 2015 – Secure employment can contribute to the financial stability and well-being of families. Unfortunately, since 2000, many middle and low-income families have experienced high rates of employment insecurity. 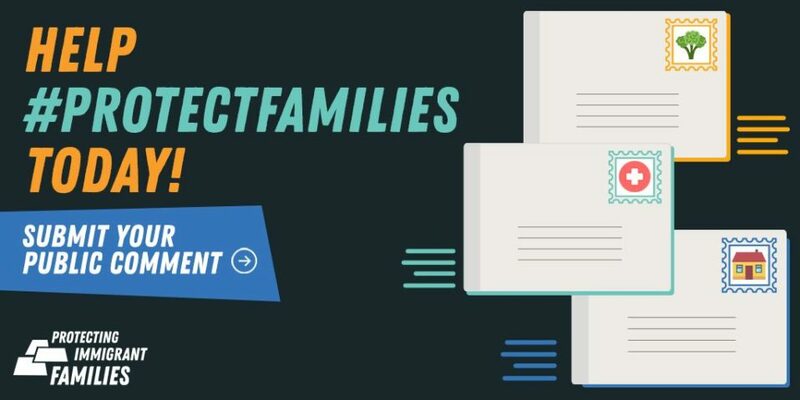 Too many parents lack the education and skills needed to secure a family-supporting job and are forced to piece together part-time or temporary work that does not provide sufficient or stable income. Even a full-time job at a low wage does not necessarily lift a family out of poverty. Without access to benefits and tax credits, a single parent with two children would need to earn $9.55 per hour working full time just to reach the poverty level. Children living in households with a high housing cost burden: 22% (106,000 children) in 2015 – Family income is only one component of financial security; the cost of basic expenses also matters. Housing is typically one of the largest expenses that families face. Rising housing costs and stagnant or falling incomes have increased the burden that housing cost is placing on family finances. Low-income families are more likely to experience a housing affordability problem (spending more than 30 percent of pretax income on housing, whether they rent or own). Paying too much for housing limits the resources families have for other necessities like food, health care, transportation and child care. Teens not in school and not working: 6% (6,000 teens) in 2015 – Teens ages 16 to 19 who are not in school and who are not part of the workforce (referred to as “opportunity” or “disconnected” youth) are at high risk of experiencing negative outcomes as they transition to adulthood. Youth who drop out of high school, who are involved in the justice system, who become teen parents or who age out of foster care comprise part of this population. 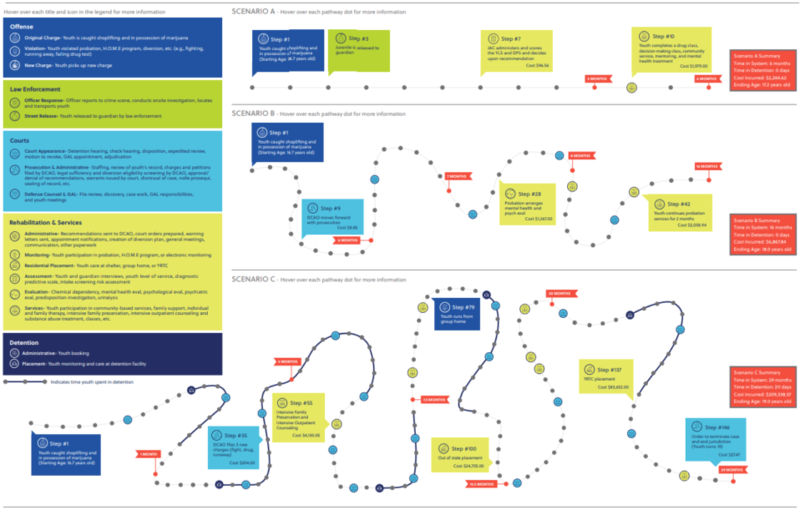 Limited skills and work history, combined with limited financial resources to invest in the development of these skills, restrict access to good jobs, as well as future higher wages and employment opportunities. While those individuals who have dropped out of school are clearly vulnerable, many young people who have finished high school but are not working are also at a disadvantage in terms of achieving economic success in adulthood.